Recumbent trikes are stable and, by design, tailored to specific capabilities – exercising fully functioning limbs while providing therapy and recovery for muscles impacted by injury or disease – providing solutions for those living with or recovering from stroke, Parkinson’s, TBI, amputations and spine/nerve damage. On our showroom floor you’ll find trikes purpose-modified to get customers back on the road – our right-hand drive Catrike Trail has Shimano DI2 Electronic shifting and Tektro single-hand operation (“twinned”) hydraulic disc brakes (single-side operation can either right or left handed). View our gallery to see some of our customer trikes. 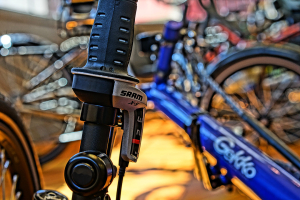 A single hydraulic brake lever provides superior braking power with very little physical effort (think power brakes!). While we like to showcase the miracle effects of trike riding, it’s important to remember that the recumbent trike is just one tool plucked from the toolbox. Any “miracle” is due solely to the grit and determination of customers who endure extraordinary discomfort to achieve recovery. For some, riding alone is a huge victory – physically and emotionally – in the battle against the odds.